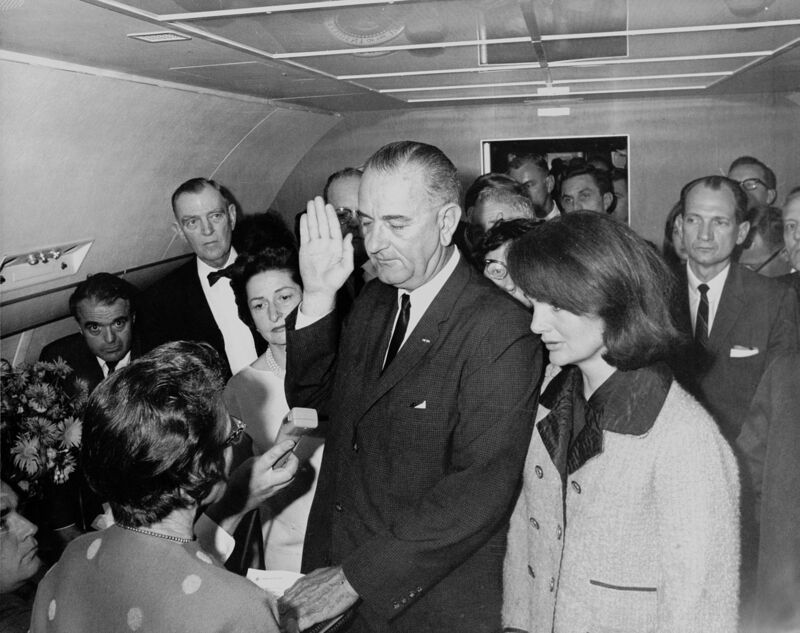 The first inauguration of Lyndon B. Johnson as the 36th President of the United States was held on Friday, November 22, 1963 aboard Air Force One at Love Field in Dallas, Texas, following the assassination of President John F. Kennedy earlier that day. The inauguration marked the commencement of the first term (a partial term of 1 year, 59 days) of Lyndon B. Johnson as President. This was the eighth non-scheduled, extraordinary inauguration to take place since the presidency was established in 1789. For the inauguration twenty-seven people squeezed into the sixteen-foot square stateroom of Air Force One for the proceedings. Adding to the discomfort was the lack of air conditioning as the aircraft had been disconnected from the external power supply, in order to take off promptly. As the inauguration proceeded the four jet engines of Air Force One were being powered up. At almost exactly the same time as the ceremony, CBS anchor Walter Cronkite read aloud on the air wire copy from the Associated Press officially confirming Kennedy's death, subsequently adding that Johnson would be sworn in as president. According to the Museum of Broadcast Communications's Encyclopedia of Television, during their frantic afternoon coverage of the unfolding events, American broadcasters made a "determined effort" to refer to him as "President Johnson".